For prices on what I use, check out Amazon. 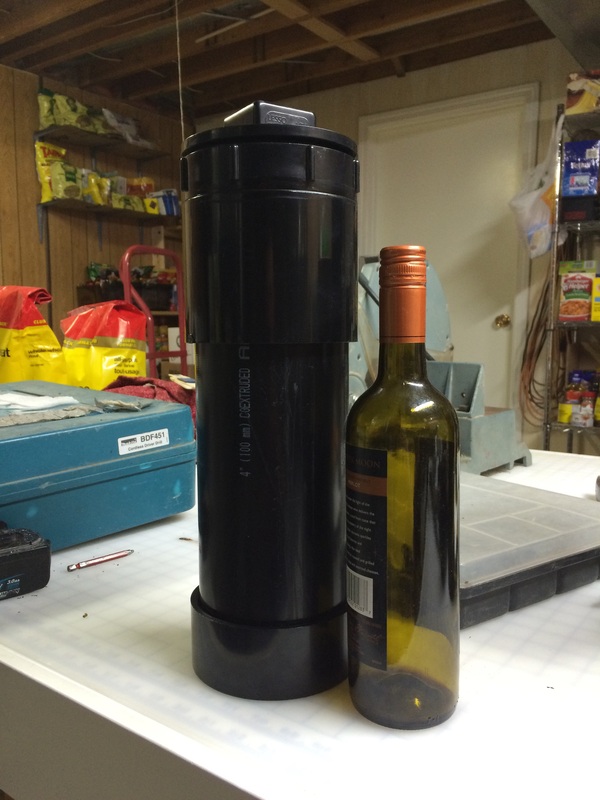 Cut PVC pipe to be approximate length of a wine bottle (12-14″). Apply glue to the various parts (cap, joiners, cleanouts). DO NOT put it on the Male screw caps or you will not get it open. Firmly press parts onto the pipe. Let dry for 72 hours to cure. Makes 3 cases. Fill up to the next of the bottle with water, add 2-3 tbsp. rubbing alcohol. Freeze for 4-5 hours. Do NOT over freeze or your wine will freeze. If you are using a wine that has an alcohol content of below 10%, keep checking the canister every 30-60 minutes after the first 2 hours to ensure the wine isn’t frozen. Remove from freezer. Will keep ice cold for 9-10 hours. These will weigh about 15-20 pounds so be prepared to have a heavy pack. Warning/Note: I do NOT support heavy drinking while hiking. Everyone is different and everyone has their own alcohol tolerance. Know your limit and hike safely within it. I am not responsible for anything that may occur on YOUR hike.